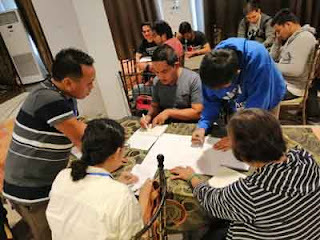 LEGAZPI CITY (Bicol Standard)—To encourage and facilitate compliance with the Occupational Safety and Health Law, Department of Labor and Employment Bicol held Safe Tres, a five-day 3-in-1 advocacy training on April 1 to 5 in this city. The training was in collaboration with partner agencies such as the Albay Public Safety and Emergency Management Office (APSEMO), Philippine Red Cross Albay Chapter and the RBA-Environment, Health and Safety Consultancy & Training Solution. Under DOLE Department Order No. 198-18 Series of 2019, among the required training modules to be complied by private establishments are Safety Officer 1 (SO1) for low risk establishments with 1 to 50 employees and medium risk establishments with 1 to 9 employees; First Aid training and Certification as First Aider and; Emergency and Disaster Preparedness Planning. “A safe, healthy and prepared worker is a productive worker,” Regional Director Atty. Alvin M. Villamor said of the activity. “It is our top priority to ensure the protection of every Bicolano worker against injury, sickness or death through safe and healthful working conditions,” stressed Atty. Villamor. Safe Tres was conceptualized to address the noted deficiencies of the micro and small enterprises with OSH Standard, particularly on the low risk type of workplaces as well as the imperatives brought about by the peculiarities of Bicol region as a disaster-prone region. Villamor added that the Bicol region is considered as one of the most disaster-prone areas in the country. It is often visited by typhoons and is home to two active volcanoes: Mount Mayon in Albay and Mount Bulusan in Sorsogon. Thus, emergencies and disasters can strike anywhere and at any time bringing workplace injuries and illnesses with them. “We have all threats of disasters, either man-made or natural disasters, so it is imperative that employers have to create robust and comprehensive emergency and disaster preparedness plans for their organizations and establishments,” Villamor continued. He said that well-developed emergency and disaster preparedness plans, and proper worker training will result in fewer or less severe worker injuries less damage to the facilities during emergencies. ‘Safe Tres’ will not just benefit the private establishments and respective workers, but most importantly, their adjacent villages as extended community. Meanwhile, the first leg of the said training was held last April 1-5, 2019 at AVP Catering Services in Legazpi City, wherein 42 employers and/ or designated safety officers participated. Taking advantage of this 5-day training package will not only facilitate compliance to OSH Standards but also minimize expenses on the part of employers to undergo trainings separately from authorized and recognized training providers. “This is also a pro-active approach in helping employers avoid the penalties in the form of fines imposed for non-compliance under the new OSH Law,” Villamor continued.